What Is a College Career Center? Almost every institution of higher learning has a college career center. Let’s face it, part of their job is to make sure their students can get jobs upon graduation. The career center is the heartbeat of this particular function. Your college’s career center offers a variety of services to help you find a job in your field of interest as well as to help you grow in your chosen career. Many schools provide employment assistance to alumni years after graduation as well. Even after you’ve chosen a major course of study at college, you might have questions concerning what career path is best for you. Your school’s career center is the place to go for guidance. Career counselors at the center can assist you in choosing a major and also in deciding on a specialization within that major. These counselors can also help you determine what type of work best suits your personality, skill set and personal preferences. Once you choose a major and a career path, a career counselor at the center can assist you on setting and meeting your career goals. Many undergrads consider graduate programs. The staff at a school career center often provides insight and direction concerning whether or not to continue with higher education as well as what graduate programs best suit a student’s needs. Just as the center helps with preparation for employment, the center also assists with application and preparation for graduate school. Many institutions of higher learning provide career services for alumni. Career centers offering credential management keep student files that include letters of recommendation as well as student transcripts. At the request of an alumna, the center will send these letters to prospective employers or graduate programs. Often there is a fee for this service, but it is a valuable way to keep track of personal records, especially during the first few years following graduation. 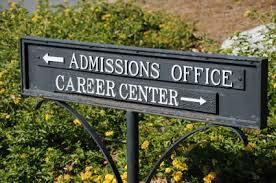 Career services provided by a college or university are an important aspect of collegiate life. In fact, students choosing a college should take the time to learn about the school’s career center before making a final decision. Schools with efficient and effective career counseling and job placement programs are most always a better choice for your education. After all, you need to be able to find gainful employment in your chosen field once you’ve earned your degree. Now that you understand what a college career center is, you should take the time to visit the career offices at any school you consider attending. Make sure your college tour includes a stop at the career center..